80% of North Americans will never see the Milky Way. Light Pollution affects the natural environment, wildlife and human health. Light Pollution deprives Yukoners and our guest of a basic human right: the inspiration of our Northern Skies. The Light Pollution Abatement Project works to raise awareness of Light Pollution and provide constructive solutions to both meeting our communities’ need for responsible light at night while at the same time reducing the impact from light pollution. Why does Light Pollution matter? The inappropriate or excessive use of artificial light at night – known as Light Pollution has serious consequences for humans, wildlife, and our society. Visit the International Dark Sky Association (IDA) for more fulsome introduction to Light Pollution. 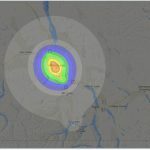 Is Light Pollution a problem in the Yukon? In most Yukon communities, the Milky Way, our home galaxy, is not visible in the night sky. From Whitehorse the light pollution extends more than 50 km away: almost to Carcross and halfway down Marsh Lake and Lake Laberge. For more, see the The New World Atlas of Artificial Night Sky Brightness. What can be done about Light Pollution? Write your local Mayor & Council, Chief & Council and Member of Legislatively Assembly. Ask them to take action to reduce light pollution. Elected officials need to know they have widespread public support to give them the courage to act. We ALL need to write our elected officials. Make change at work: Talk to your property manager to make change at your workplace. Keep asking as change will be slow. Talk to and educate your co-works about light pollution. For more ideas on how to get involved, visit the International Dark Sky Association. Demonstrating success is this image from Flagstaff AZ and Cheyenne, WY (top and bottom respectively). Both are similar sized US cities, but decades of light pollution abatement work and light-pollution bylaws has resulted in nearly 14-times less sky glow from Flagstaff. With hard work and concerted effort by the entire community, we can reclaim our night-sky heritage. 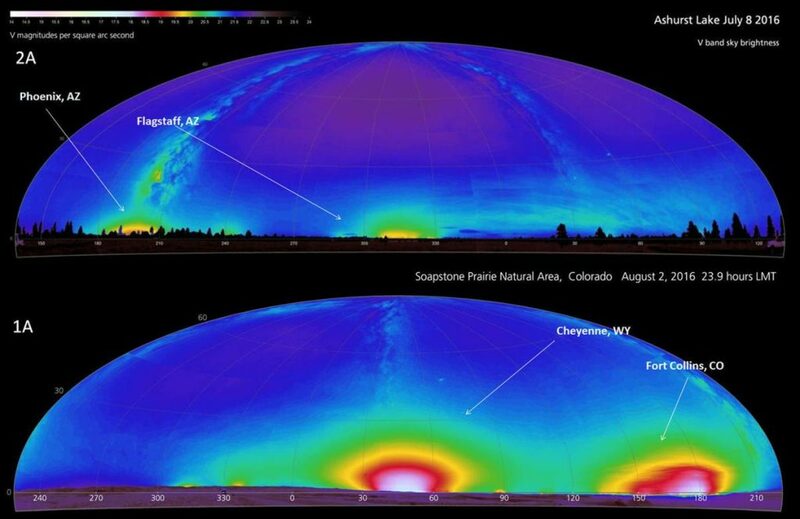 Two images created from nighttime observations taken in July and August show light pollution from Flagstaff (top) and Cheyenne, Wyo. The colors represent brightness of the sky, with white, red and yellow indicating brighter light. 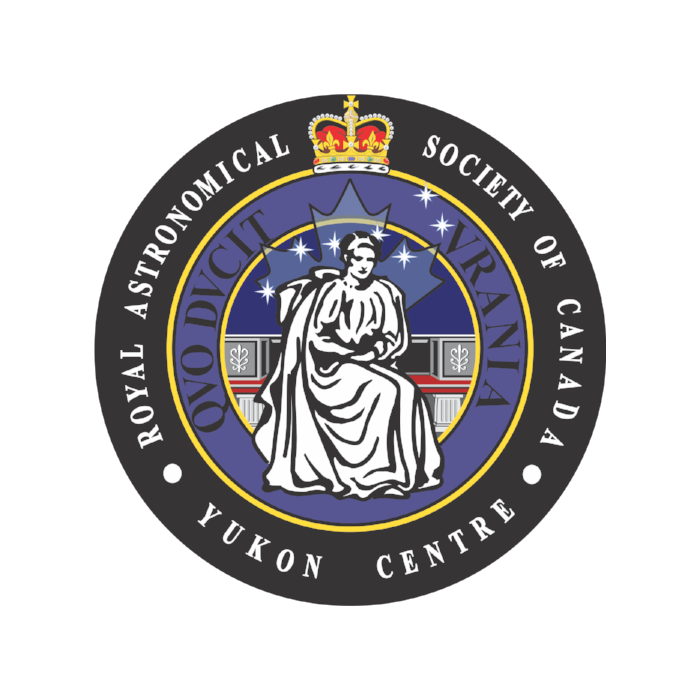 Archive of Yukon Astronomical Society’s light pollution related outreach. Could Plans to Minimize Light Pollution Actually Lead to a Loss of Dark Skies? New LED lights are planned for a section of the ring road near the Rothney Astrophysical Observatory. 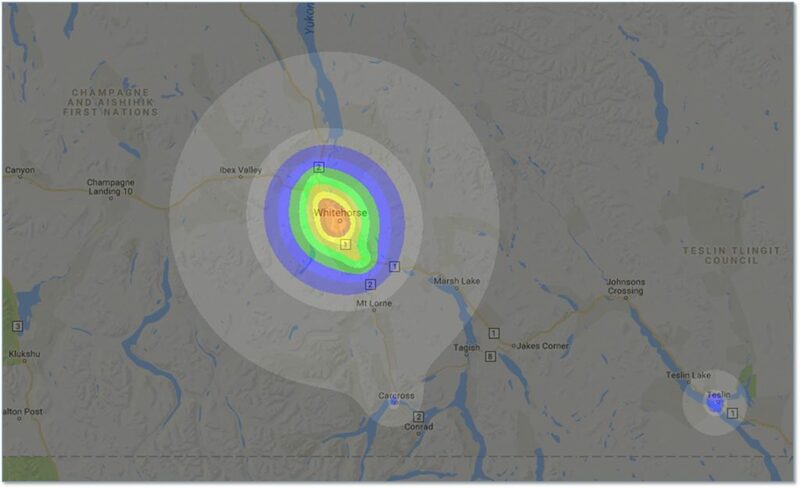 Good news: The City of Whitehorse, Yukon's draft Downtown Plan list light pollution as its first environmental priority for the downtown area! Can Salmon Help Save the Night Sky? More research has come out in the last year that show artificial light at night is hazardous to sub-yearling Chinook Salmon. The researchers state: "A major concern of artificial nighttime lighting for subyearling salmonids is the potential for an increased predation risk, and ... the prudent management goal would be to minimize artificial nighttime lighting." Want to make a quick change at your home to reduce light pollution? Change your outdoor bulbs to amber colour. Home Hardware in Whitehorse sells these "Vintage" LED bulbs that are 2200K (lower colour temperature is a "warmer" colour). Research published this year shows that most song birds migrate at night, but their migration patterns are disrupted by artificial light from our communities. The light lures birds to communities where they become disoriented and at risk of collision with buildings, collision with vehicles, and getting eaten by cats, which are a major predator. The researchers continue: "Domestic cats could be the largest anthropogenic source of mortality for birds. If birds are being drawn into these heavily developed areas, it may be increasing their risk of mortality from anthropogenic sources and it may also be that the resources in those habitats are going to be depleted much faster because of competition with other birds"